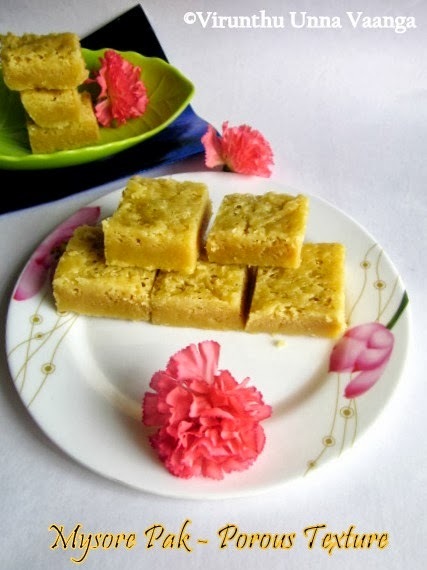 Today’s feast for you is MYSORE PAK. 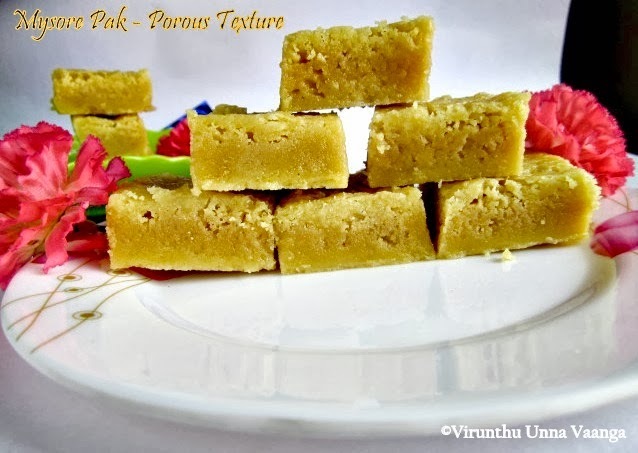 I love both types of mysore pak which is soft like sri Krishna sweets, and hard type which is porous in texture. 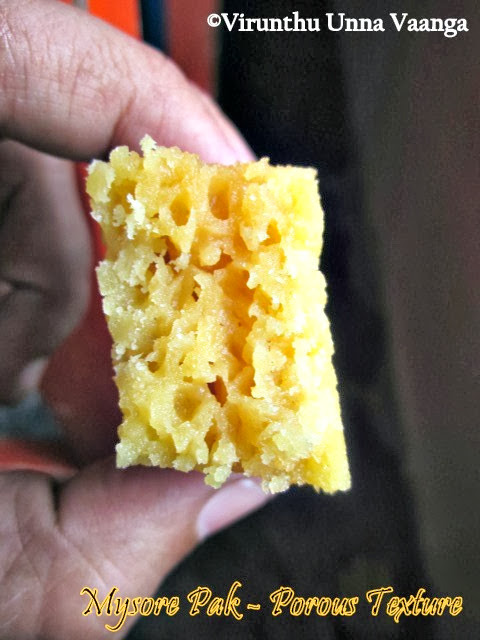 Usually my aunt brings sri Krishna sweets mysore pak from Coimbatore whenever she comes here. In my native also is there, but I never visited there even I don’t know where is it... But I love hard one than the soft variety. 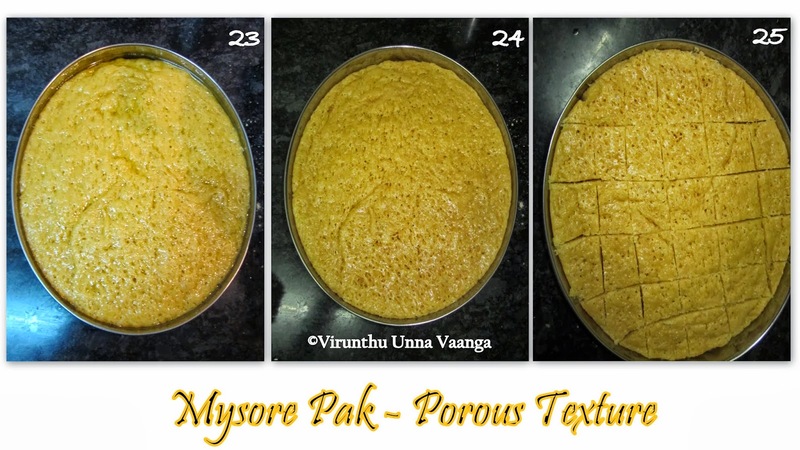 It will be inner dark and outer light brown, so I want to make the hard type, because that type of mysore pak won’t available nowadays. 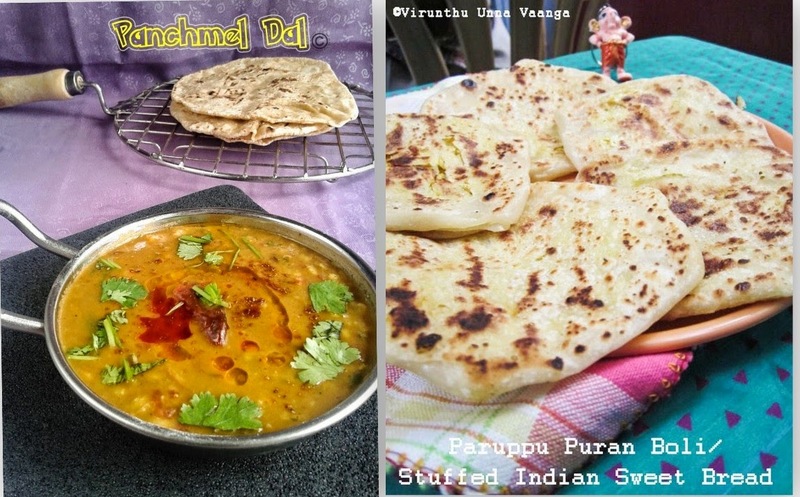 For the recipe, I referred many sites and asked friends, finally +Manjula Bharath and +Nalini suresh aka told the method and I saw the detailed video in vahchef. Thank you dears.. 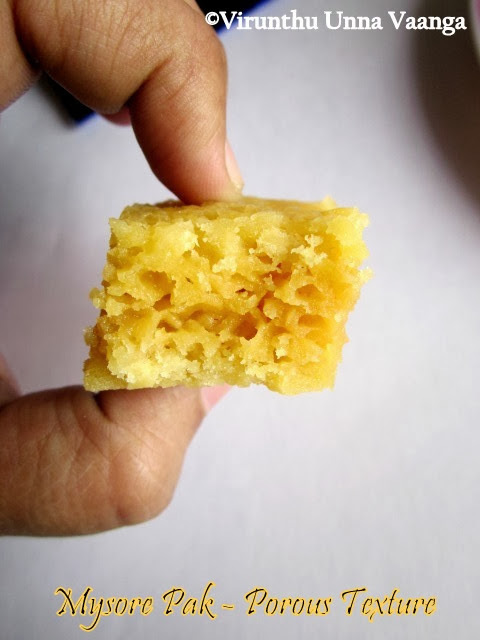 Grease the tray with ghee and keep it aside, after you start the procedure you won’t get time to do this. Heat one cup of oil in a pan on low flame. Take besan flour into a wide mixing bowl and keep ready the siever. Now add 2 Tbsp of hot oil into the besan flour, you will hear “Shhh” Sound, then carefully mix it like crumbles. Sieve the flour completely and keep it nearby you. Add one cup of ghee with hot oil and keep the flame on low and keep long ladle near for later use. Now take a wide big kadai, add sugar and water dissolve in low-medium flame. Keep a small bowl of water nearby you to check the sugar syrup consistency. If the sugars will dirt, add a Tbsp of milk to remove the scum. Check the single thread consistency by adding a drop of syrup into the bowl, it will be settle down without dissolve in the water or you can check with your hand by stretching you thumb and index finger, you can see the thread form. 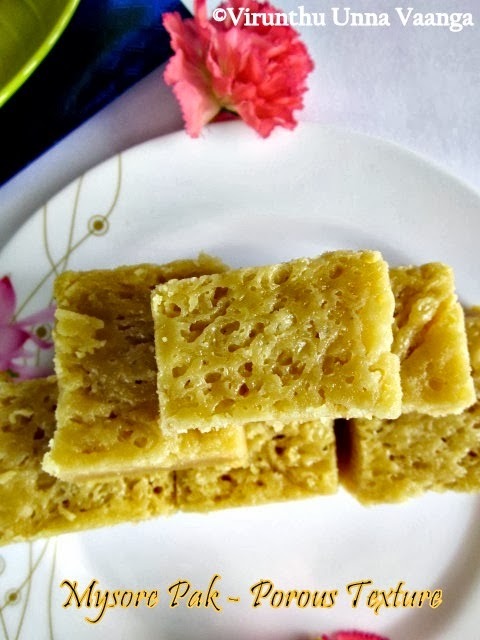 It’s the correct consistency; sugar syrup will be in good frothy and now add besan little by little and stir it continuously without forming any lumps till you add all the flours. Now keep stirring and able to see the bubbles in the mixture. This is the right time to add hot oil-ghee mixture into this. 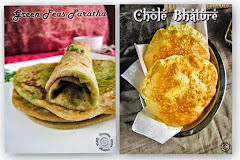 Add one ladle of hot oil-ghee into the besan, you can see good froth, keep adding oil-ghee with non-stop stirring. 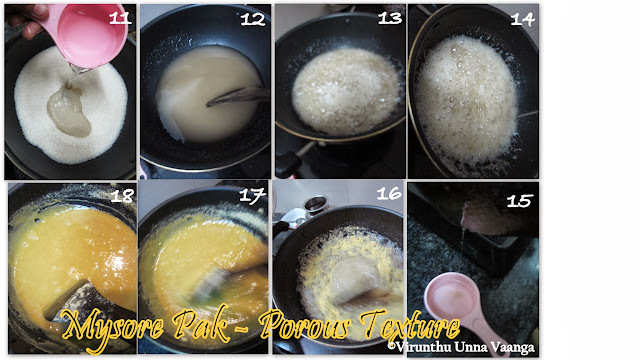 After 30 sec to 1 minute you can see, the mixture won’t stick into the pan, the oil-mixture leaves the pan on the edges and the color will start to change in dark. Switch off the flame immediately, and pour the hot besan mixture into the greased tray carefully. Let it be rest for 2-3 minutes and cut into squares with sharp knife. Separate each pieces after it cool down completely. 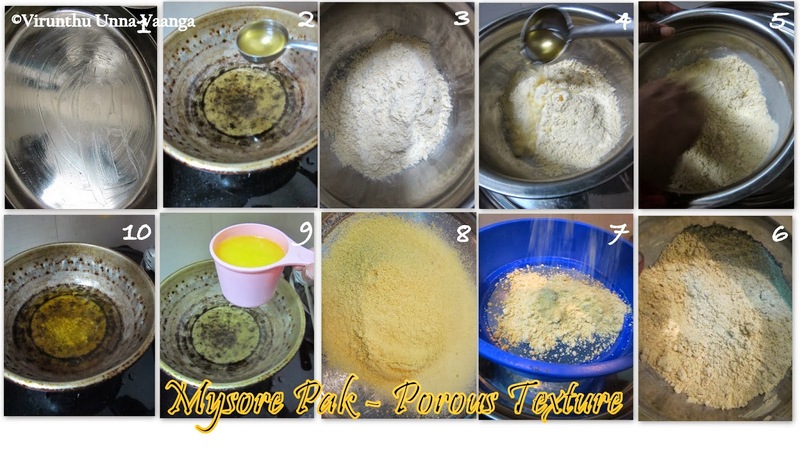 Be careful while doing the entire process because you are playing with very hot oil-ghee. So better keep away from children while doing this. 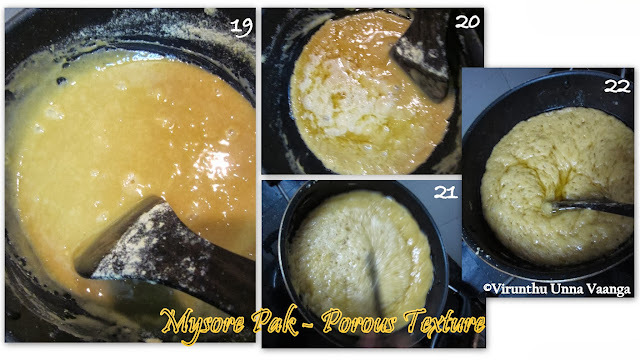 Sugar syrup is more important, single thread consistency is must to get good result of mysore pak. 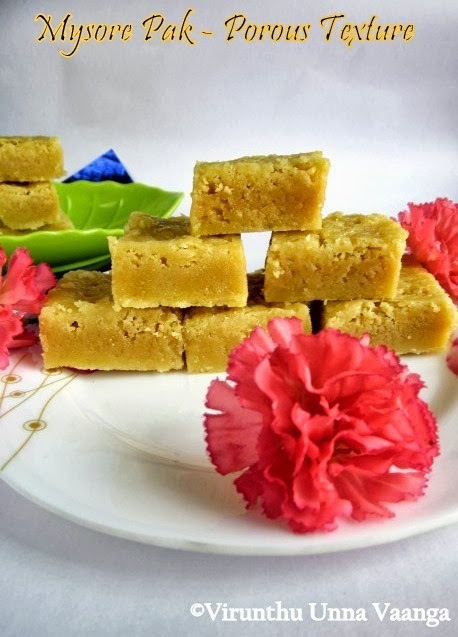 While adding hot oil-ghee to this, it will be super frothy, its the reason of getting good pores in mysore pak and it will cook the raw flour easily. once we made this on SNC event. Never forget the taste. You made it so well Viji dear...just awesome! 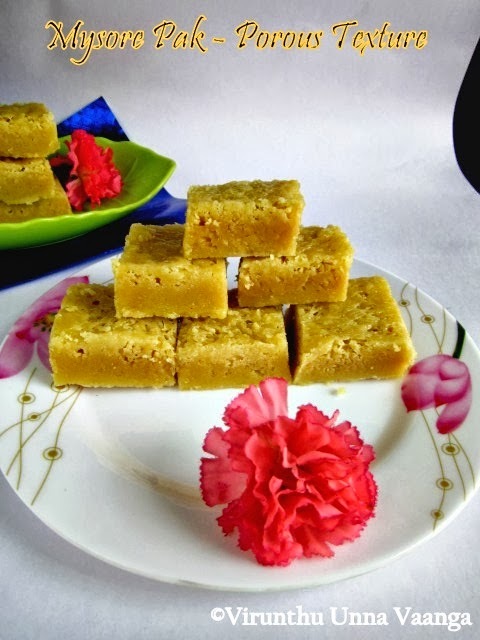 wow very nice textured mysore pak and looks so tempting viji :) You are rocking with you diwali sweet collections :) am drooling here ! !keep going !! looks very perfect n super delicious. Great job done. 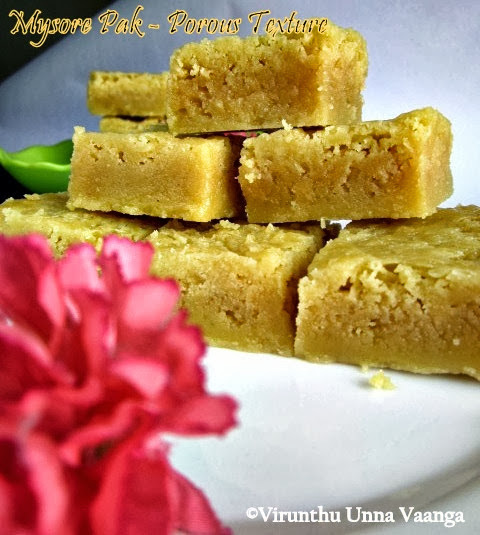 Lovely soft mysore pak.I love srikrishna mysore pak too.Wonderful post. 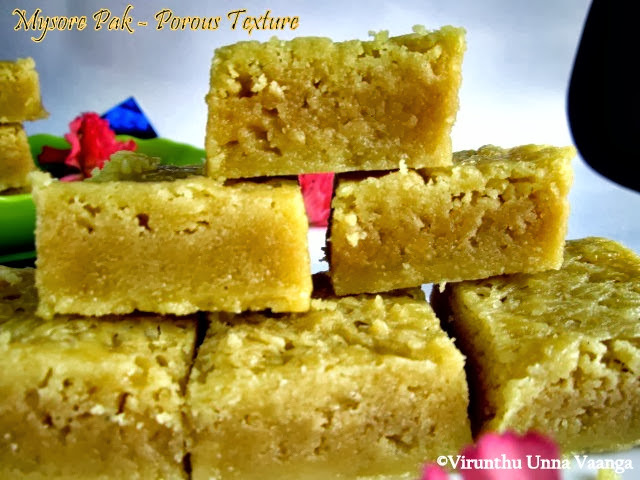 Yennaku oru parcel ippave venum..love those porous texture, love this mysore pak very much than the soft ones. Hi. I tried making it, but the final outcome I didn't get as desired. 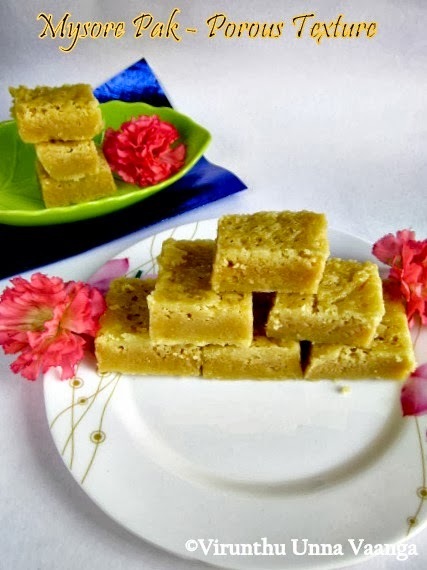 It became very soft that am not able to make into pieces (became like halwa). Can you suggest what should I do to correct it.